The New York City Council this week passed legislation barring employers from asking about salary history. Equal pay advocates hope the move will help close a gender wage gap they say disproportionately hurts Asian, black, and Hispanic women. “Being underpaid once should not condemn one to a lifetime of inequity,” Public Advocate Letitia James, who introduced the bill in August, said in a statement. The bill sailed through the council on Wednesday — a day after Equal Pay Day — by a 48-2 vote with one member absent. James, the city’s watchdog with power to introduce legislation, said the measure will affect 3.8 million workers by preventing both public and private employers from inquiring about past salary. The bill is now on New York City Mayor Bill de Blasio’s desk, ready for signing. A spokesperson for the mayor’s office told NBC News that de Blasio worked closely with the City Council on the legislation and looks forward to reviewing it. 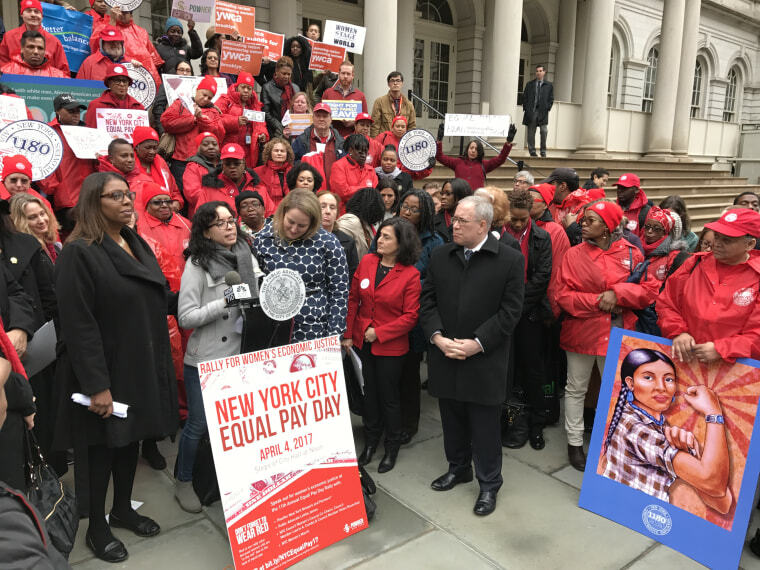 Supporters say the measure could help bring pay equity to all women in New York City — including Asians, blacks, and Hispanics — who earn less on average than men. A figure from a report from the office of Public Advocate Letitia James detailing the gender wage gap in New York City. A report last year from James’ office said women in New York City annually make $5.8 billion less than men. White women working in the city full time take in 84 cents for every dollar a white man earns, the analysis found. But for women of color, the gap widens considerably, according to the report. Asian women working full time in New York City earn 63 cents for every dollar made by white men, the findings showed. The amount was even lower for blacks at 55 cents and Hispanics at 46 cents. Nationwide, the wage gap between Asian women and white men stood at 14 percent — a divide that more than doubles (37 percent) in the Big Apple, the analysis found. “In the Asian community, women from all income and educational backgrounds are affected by wage disparity — particularly those with limited English proficiency, whose occupational options are few — and will stand to benefit from this bill that seeks to remove a significant barrier to more equal pay,” Asian American Federation executive director Jo-Ann Yoo said in a statement. Since the bill’s introduction, some public and private companies have already prohibited inquiring about salary history, according to James’ office. New York Gov. Andrew Cuomo and de Blasio, both Democrats, also signed executive orders barring the practice for public sector hires, the statement said. Across the country, state legislators have introduced at least 180 bills to reduce the pay gap since 2016. While nearly 50 failed or were vetoed, seven were enacted and dozens were pending. Congress also reintroduced federal pay-equity legislation on Equal Pay Day, celebrated this year on April 4. The federal Equal Pay Act of 1963 already requires men and women in the same workplace to receive equal pay for equal work. Over the years, the gender wage gap has narrowed for all workers, from 36 cents in 1980 to 17 cents in 2015, according to the Pew Research Center. Reasons for the continued disparity include a higher proportion of women taking career breaks to care for their families, women being overrepresented in lower-paying jobs, and gender discrimination, according to Pew.